ABA Kicks off Out Of Russo’s Marina Saturday morning promises to be a good tight Tournament as Fall winter conditions settle in. Here is your fishing report for Dec. 1 through Dec 7, 2018. Looks good as anglers take advantage of cooler water temperatures with Stripers and Smallmouth leading the way. Water temperatures have dropped with the cooler storms. VBO Vince Borges has been putting on a clinic and for huge Stripers in the shallows as we fin ally got some weather! Fair for the trolling anglers, but fish cracking the 15 pound plus keeps anglers hopes up. Savage Prey series and Angry Eyes are the top choices here as well, there seems to bit more call for chartreuse patterns here. Bank anglers livers and cut baits prevail for plenty 2 to 4 pound catfish evenings are top for those looking for a few bites. Bass anglers try some smallie fishing, crankbaits and brown blue jigs and getting the Smallmouth. Some nice fish coming out of Discovery Bay this week. Bigger fish have been falling for a 8″ Savage Gear 3D SHINE GLIDE. Dropshot will put more fish in the boat but the size is just not there. A-rigs and Rip Baits starting to work well now. Dress warm and enjoy the your time in Discovery Bay. Some Nice fish are coming Cranking Square bills like the DDO custom KP used to land several like the one pictured this week. Stripers and bass bite both OK but ya gotta Slow down with the cold temperatures. It’s no secret what a little fall weather can do. Ripbaits are great options while small swim baits and swim jigs get the mention. 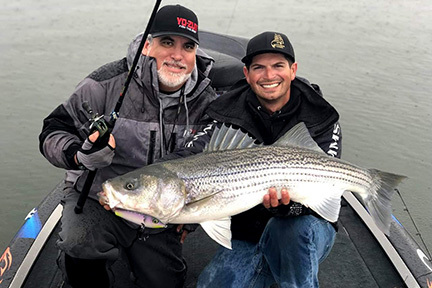 We found plenty of Stripers and Black Bass with A-rigs, Swim Baits, like the Bone Colored Shine Glides getting grabbed. Lot of Stripers in main River and Mildred areas. The West as in Honker Bay to the Bait tossers are getting fish when wind cooperates. Sturgeon quietly is slipping into the spotlight. Eel is the best bait over all, but night crawlers, roe and shad also scoring diamondbacks Broad slough and surrounding cuts. There were many shaker sturgeon reports in double power lines in Decker Island and Sherman Island. There were few shaker sturgeons also reports from Light 42 to Light 49 in the deep channel Most of the nice stripers coming soaking Shad, anchovies and sardines . Fishing for trout continues to be good even with the increased water temperature. They are being caught in South Cove and Oak Point as well as Peninsula Cove. The baits of choice for shore anglers are garlic-scented PowerBaits, nightcrawlers or Kastmaster lures. Trout average a pound and a half but range to over 5 lbs. There was a 1000 pound Lassen plant. Light tackle is important for catching trout with 4-6 pound test being plenty. Trout fishing is good especially in the morning, with limits being caught from around the reservoir and more fish being caught overall. Several large trout were brought into the Marina this week. These included an 8 pound fish caught on a Kastmaster in South Cove, a 7.1 pounder caught in Cowboy Cove on powerbait and a 7.2 pound trout caught on a nightcrawler in South Cove. More limits are starting to show up from South Cove and from boats around the lake. 500 Pounds of trout planted this week have anglers smiling. While there are very few anglers taking advantage of the put and take trout fishery here that action is solid. Kastmasters and floating baits are the keys. Marshmallows and crawlers are working for Loma regulars.